The TAC_Revolution continues with TAC:Four. The players spoke and Hori listened. NEW FEATURES INCLUDE: additional PC-Style crouch and sprint buttons located at the bottom-left of the keypad (right by your pinkie finger) AND re-designed Optical Gaming Mouse with sleek, ergonomic design, additional buttons, matte finish and better build quality. SOFTWARE COMPATBILITY is now possible. 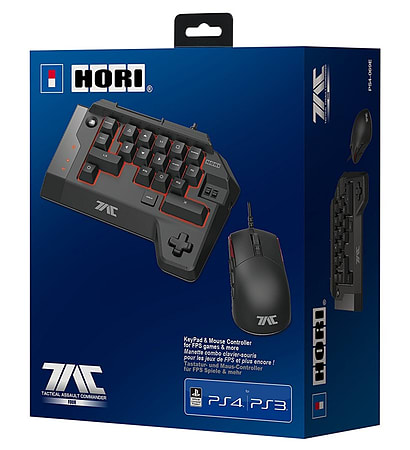 Download the TAC software from http://www.hori.jp/products/p4/p4_tac_m1/ to customise profiles on your PC. There are tonnes of pre-made profiles to try out on the Hori website. Hori is doing the work for you! TAC:Four gives console gamers the ultimate experience when it comes to FPS control. Using HORIs Mouse and Keypad setup, gamers will be more precise, quicker on the draw, and able to customise their experience far more substantially due to the increased amount of input command options available versus a standard controller. The TAC:Four has additional buttons: SNIPE, QUICK and WALK. These buttons allow gamers diversified options in their play-style. This, combined with total freedom to map and re-programme all inputs means that TAC users can tweak the controls to match their playstyle. Working touchpad, LED programming display, Options, Share and PS button complete the experience. This is expert level PC-Style Gaming for the PS4 and PS3. Last but not least, there are 3 profile options so users can save different settings for different games. HORI understands that there are lots of FPS games - all requiring a different play-style. Customise, Tweak then save to your hearts content with the TAC:Four - Dominate the battlefield.